The new Maxis FastTap service lets customers use Nokia NFC phones to make Visa PayWave contactless transactions and pay for tolls, transit, parking and theme park charges. LANDMARK ACHIEVEMENT: FastTap scores several firsts, including being the first commercial implementation of Visa payWave on NFC phones. The world’s first multi-function NFC payments service has now gone live in Malaysia. Maxis, the largest wireless carrier in Malaysia with more than 11 million subscribers, Nokia, Maybank, a leading Malaysian financial institution, and transport payment card issuer Touch ‘n Go have teamed with Visa for the launch. Customers who sign up for the new Maxis FastTap service are able to use their Nokia 6212 Classic phones to purchase goods and services at more than 1,800 Visa payWave merchant locations as well as pay for toll, transit, parking and theme park charges at over 3,000 Touch ‘n Go points nationwide. The service allows Maybank Visa account holders to simply wave their NFC-enabled Nokia 6212 Classic handset in front of a contactless reader to complete a secure Visa transaction in a matter of seconds. Maybank Visa account holders can download their Visa payWave credit account details directly to their Nokia 6212 Classic handset over the Maxis wireless network. Once the account has been personalized on the phone, account holders can then begin to make purchases at any one of the 1,800 merchant outlets that currently accept Visa payWave in Malaysia. It is the first commercial service to integrate multiple NFC applications for contactless credit card payment (in collaboration with Maybank and Visa) and Touch ‘n Go electronic payment for transit, toll and parking payment on the same device. It is the first commercial NFC service to feature over-the-air personalisation of credit card information over a mobile service operator’s network using a Trusted Service Manager interface. “This service is one of those miracles of mobile phones that we have often fantasized about in the past,” he added. “With this advent in technology and payment convenience, customers can now conveniently shop with their mobile phone. They can use it at any Visa payWave retail outlet and will earn TreatsPoints when performing a payment transaction,” he added. Maxis has produced a FastTap user guide (pdf) which provides more details of how the system works and which companies are involved. 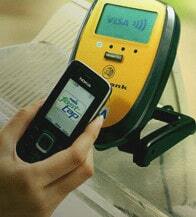 The launch follows a successful trial run by Maxis and Maybank in conjunction with Touch ‘n Go, Visa, RapidKL and Nokia in and around Kuala Lumpur from October 2007 to February 2008.